5 liter original, commercial-type canisters of brake fluid. No decanting necessary. As an option, the BW 1408 is available with an integrated refill tank (see below). The compact size makes it ideal for mobile use on the go. The cone-shaped plug adapter reliably fits different diameters of canister spouts. A receptacle beside the canister compartment provides space for storing tools and accessories. The durable and padded handle makes transport easy - even with a full container. The pressure is adjustable from 0 to 2.8 bar. The brake fluid is drawn from the container with a tank pipe fitted a with ribbed, cone shaped adapter to fit different spouts. The canister is safely placed inside the integrated compartment behind the control panel. The device pumps brake fluid from the tank into the master cylinder fluid reservoir fitted with a special quick-lock adaptor. The pressure is built up slowly when the pump is activated to avoid foaming of the brake fluid. The flow oscillates to flush and vent even the smallest air and moisture locks or dirt and debris out of the hydraulic system to ensure a complete flush and bleed. When the canister is empty, a preset pressure switch set automatically deactivates the unit to avoid air being accidentally pumped into the hydraulic system. Once the process is complete and the pump is turned off, the built-up pressure escapes through the integrated recirculation system and the fluid level inside the reservoir adjusts itself accordingly. Once the pressure has fallen to 0 bar/psi, the quick-lock coupling can be disconnected from the adapter without risk of spilling brake fluid. 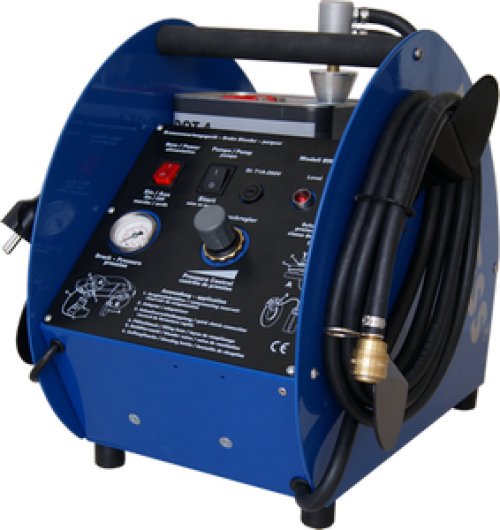 The 3.5 m long flexible hose gives plenty of room to change brake fluid up on a car lift. The unit is also available with an integrated 6 liter (>1.5 gallon) tank. The plug adaptor is hereby replaced with a screw adapter to fit the tank spout.